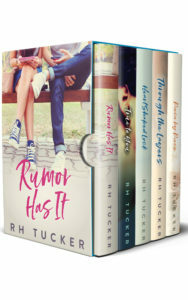 I’ve decided to bundle the five full-length novels in the Rumor Has It series into one box set! Rumor Has It, True to You, Heart Shaped Lock, Through the Layers, and Piece by Piece are all included in this box set and it’s only $9.99 on Amazon. 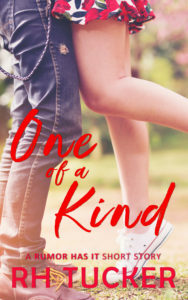 And it’s also available in Kindle Unlimited! With the release of my newest book, I included this personal letter to readers in the back. I’m posting this to my blog because I want to make sure anyone who enjoys my books knows how much I appreciate them taking a chance on an independent author like me. Here we are. Piece by Piece is officially out in the world, and I have now published five full-length novels and two short stories. My journey as an independent author so far has been a crazy and incredible journey. Rumor Has It started out with the title “i emoji u.” True to You started with the title “Cosplay Love.” Things evolve and change over time, and so did those stories. What’s always stayed the same is my desire to tell a good story. Yes, I’m a writer and an author, but I first and foremost think of myself as a storyteller. I want to tell a good story. One that you can’t put down. I have written other works. I have four full-length novels that will probably never see the light of day because they just aren’t good. This isn’t fishing for encouragement. We all start somewhere, no matter what type of ocean we want to sail our boats in, and those boats were full of holes. Rumor Has It has its flaws, I’m well aware of those. As does, True to You, Heart Shaped Lock, Through the Layers, and yes, I’m sure Piece by Piece has its flaws, too. But one thing I’m reasonably certain of is that each book is better than the last. Rumor Has It, and True to You, were written at practically the same time, so those are probably closest as far as my development as an author, but Heart Shaped Box came next. Through the Layers came after that. And now Piece by Piece, and yes, I still feel like I’ve gotten better. I genuinely feel like the more I write, I keep learning how to write a better story. I hope that it shows. I plan on my next book to be better than the one I just published. I hope it is. And I really feel like Piece by Piece is my best work yet, so here’s to high hopes for my next series. Throughout writing the Rumor Has It series, I feel like I’ve developed a sense of who I am as a writer, what kind of stories I want to tell, and how I want to tell them. My running joke-but-mostly-serious tagline for myself as a writer is, “I write books that could be a show on The CW. Or a Freddie Prince Jr. movie.” It’s funny, but it’s true. I think. Most importantly, none of this would be possible without you. The reader. You’ve emailed and messaged me, asking about the stories. Asking about the characters. And that’s motivated me to keep going. It’s driven me to continue to tell these stories because you’re out there and you want to read them. That feels amazing. Thank you for taking a chance on me, an independent author, and my books. Thank you for leaving reviews. Thank you for reading. It’s finally time! Piece by Piece is now available to download. 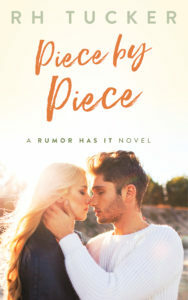 As with previous releases, Piece by Piece is only $2.99 for a limited time. After it’s launch, the price will go to it’s regular $3.99, so now is the perfect time to download. You can also read it through Kindle Unlimited!